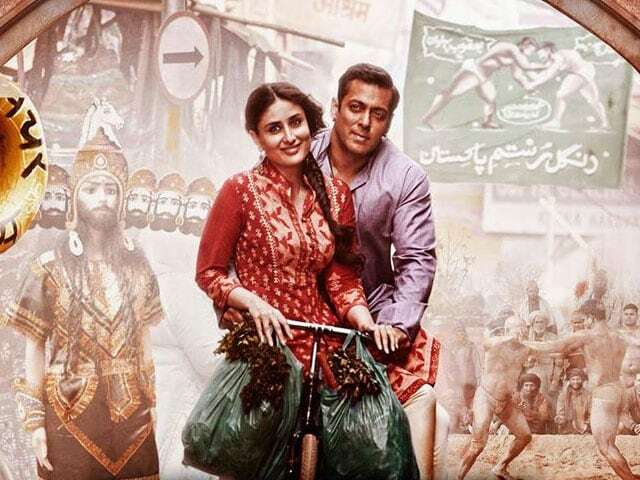 Bajrangi Bhaijaan is a supercharged cross-border drama that goes all out ? and then some ? in delivering its message of subcontinental peace. Director Kabir Khan pulls out an old chestnut ? the theme of humanity trumping a history of bitterness. Into this perennially bubbling cauldron, he throws a devout, upright Hindu do-gooder and an achingly beatific but speechless six-year-old Pakistani girl stranded on the Indian side of the border. Bridging many divides ? religion, national identity, food habits ? the two develop an unlikely bond that wipes out all prejudices. The man puts everything at stake, driven by his faith in Bajrangbali, to ensure that the lost girl makes it back home in one piece. Bajrangi Bhaijaan runs with this wafer-thin premise with such unbridled enthusiasm and vigour that you might be forgiven for wondering if the future of the universe hinged on it. But even then, strictly from the perspective of Salman Khan?s core constituency, Bajrangi Bhaijaan might seem a touch tame. The blustery superstar goes missing in Bajrangi Bhaijaan, as do his signature punchlines. It is, clearly, a calculated risk, a bid to reinvent a successful screen persona that might have outlived its utility in the light of the ageing actor?s off-screen troubles. Salman plays a Hanuman-fearing, truth-loving straight-arrow bloke from Pratapgarh, Uttar Pradesh who breaks neither the law nor bones. Main Bajrangbali ka bhakt hoon, koi kaam chori chheepe nahin karta, he says. So, he does not get into any street fights, spouts no explosive lines and does not take off his shirt. What a bore! But, then, he is no longer a mere mortal in policeman?s clothing cleansing a neighbourhood. He is now a crusader for truth and love and knows no boundaries. Like the monkey-god he swears by, he can leap over any gulf of mind and land. Bajrangi loses his cool only on two occasions ? once when he has to rescue the girl in his charge from the clutches of a human trafficker in Delhi and then in a Pakistani police outpost. Of course, what Bajrangi Bhaijaan seeks to communicate is laudable in the current climate of distrust. Wish it hadn?t made such heavy weather of the well-meaning exercise. The India-Pakistan border obviously plays a pivotal role in Bajrangi Bhaijaan. The screenplay traverses the entire distance from Wagah-Attari to Rajasthan, and from there to Kashmir, where the drama culminates on an implausibly preachy and screechy note. Forbidding fences and imposing iron gates loom into view every now and then. At one point of the film, the audience is told that the wires along the border have 440 volt running through them. So, that is the measure of the protagonist?s heroic act of escorting a mute Pakistani girl back to her village up in the mountains on the other side of the line of control. Bajrangi Bhaijaan opens in a Pakistani village. A pregnant woman, wife of an ex-army man, is among a group watching an India-Pak one-dayer on a community television set. Shahid Afridi hits the winning stroke. The crowd erupts in joy. The daughter that is born is christened Shahida. The girl cannot speak. The film makes no attempt to explain the exact nature of her congenital condition. We figure out along the way that while she is unable to speak, her ears are in perfect condition. Shahida?s mom decides to take her daughter to Hazrat Nizamuddin dargah in Delhi in the hope that divine intervention would restore her speech. On the return journey, the mother dozes off. Shahida gets off to play with a baby goat. The train leaves without her. The girl ends up in Kurukshetra and chances upon her would-be saviour, who makes his grand entry singing and dancing to the tune of Selfie lele re, with a giant Hanuman statue watching over him. The hero, Pawan Kumar Chaturvedi alias Bajrangi, son of an RSS man and a stickler for form, flunks his school leaving examination ten times and is averse to wrestling because he is tickled all too easily. When Pawan eventually passes the exam on the eleventh attempt, his shocked father drops dead. But wrestling still remains anathema to our man. In old Delhi, Bajrangi fights his own prejudices and those of the family of Dayanand (Sharat Saxena). His only ally in this battle is the patriarch?s daughter, Rasika (Kareena Kapoor in a largely decorative role). When he tunnels his way into Pakistan, Bajrangi runs into a battery of security agents and cops determined to bring the ?Indian spy? to book. He does not lie, does not eat meat, and is under oath to Bajrangbali to find Shahida?s parents. In his uphill task, he is aided by ordinary folk in Pakistan ? a journo (Nawazuddin Siddiqui), a maulana (Om Puri) and even a bus conductor who is so impressed with Bajrangi?s selfless mission that he saves him when the cops comes calling. Salman Khan may the principal driving force of Bajrangi Bhaijaan, but the real star of the film is the super-cute child actor Harshaali Malhotra. Her winning smile, her large, playful eyes and a face can melt the toughest heart, even that of a dyed in the wool film critic. Watch Bajrangi Bhaijaan even if you aren?t an inveterate Salman Khan fan. Harshaali will steal your heart.